I just realized, a lot of my 2013 pumpkin haul came from Target. Last year I had a ton of Aldi stuff, so I guess it's Target's time to shine. I am not a big fan of pre-made baked goods. I feel like a lot of them taste the same and the only Pepperidge farm product I occasional buy is the Gingerbread. (Those cookies are so light and crispy! How do they do it?) I wanted new pumpkin items this year, ones that I hadn't reviewed before, and this just happened to be out on the shelves. The bag is typical for Pepperidge Farm cookies, it's a white foiled paper bag with a fold down top. 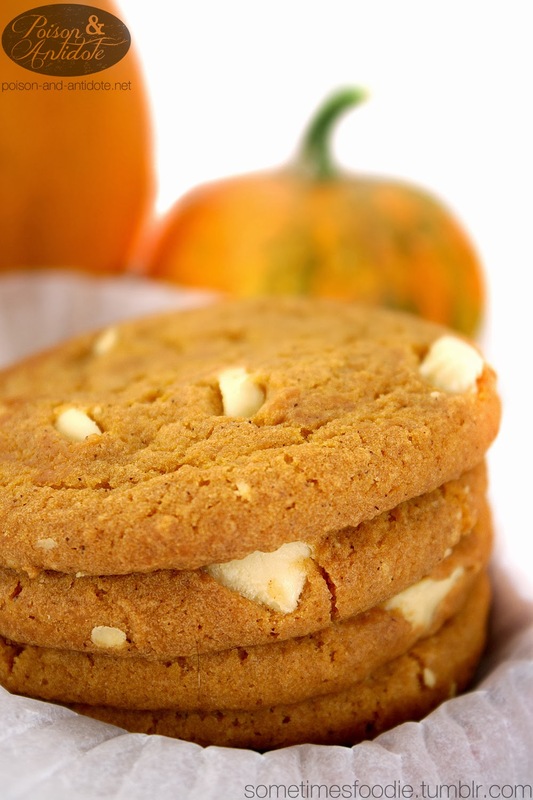 Although it still fits in with the other cookies on the shelf, this specific flavor has a bit of a seasonal spin. Orange fonts, tiny leaves scattered around the bag, and a tiny pumpkin can be seen in the background making this one a bit different from the rest. (Although it is still similar to the carrot cake cookies.) Overall, I think the photographs and design are really nice. This packaging photographed really well and I like leaving it out on the counter with a few other seasonal treats. Once separated, I grabbed one cookie and gave it a sniff. (That sounds weird.) The cream cheese flavored white chocolate chips really overpowered the spiced aroma. I can smell vanilla and artificial white chocolate with just a tiny hint of pumpkin pie spice. To me, this smells like a pumpkin cheesecake scented candle. Not the best smelling cookie, but maybe it'll taste better. 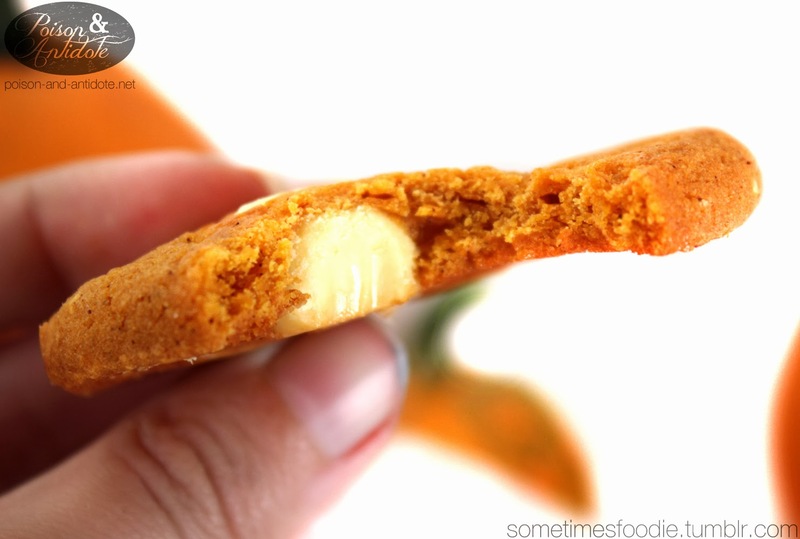 After just one bite, the cookie itself is overpowered by the cheesecake chips. You barely taste any pumpkin at all! The overall cookie doesn't taste bad, but I was hoping for a stronger spice presence. If you are one of the people who like the filling inside Oreo more than the cookie, you might like these cookies. Me? I'm more of a cookie fan. I wish Oreo sold packages of just the cookie with no cream at all, so this cookie really wasn't that appealing to me. I wanted more pumpkin than cheesecake and this did not deliver. I'm happy I bought it and photographed it, but I won't be missing this limited edition product when it disappears off the shelves. 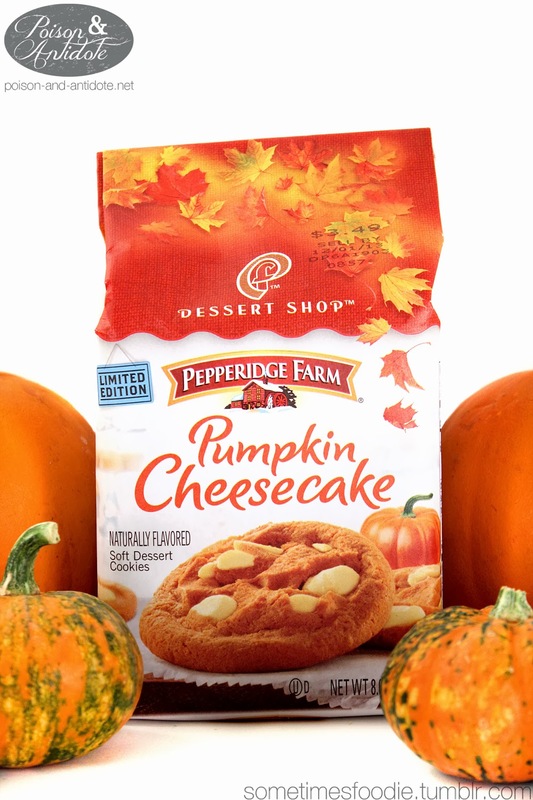 On a Pumpkin Scale of 1-5 (5 being the most pumpkin-y) I’d give this a .5, but on overall deliciousness… I would give these a 1.